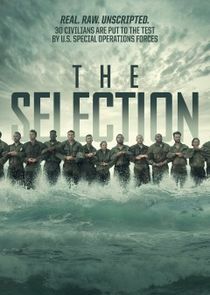 On The Selection: Special Operations Experiment, the History Channel places 30 men and women with no military background through the most intense physical and mental challenge of their lives in the new series "The Selection: Special Operations Experiment" from executive producer, Peter Berg (Lone Survivor) and his unscripted shingle Film 45 and Bunim/Murray Productions. Trained and led by veterans of the Navy SEALs, Green Berets and Army Rangers, these instructors drive those who are willing to push themselves to the limits of the human body and mind. Instructing the 30 civilian participants are six of the finest combat veterans that range across various U.S. Special Operations units including: Veteran Navy SEALs: Marcus Capone, Ray Care and Sean Haggerty; veteran Special Forces Green Berets Donnie Bowen and Bert Kuntz, and veteran Army Ranger Tyler Grey.